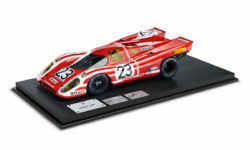 Detailed Model with the setup of Le Mans Winner car of 1970. Original signatures of Le Mans Winners 1970 Richard Attwood and Hans Herrmann. Key Features: Limited to only 50 pcs. Plexiglass cover. Made of resign. Technical details badge. 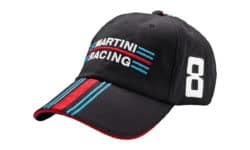 Summer is almost in the rear view mirror, take advantage of our wide selection of Porsche hats while supplies last. Please see parts for details. Attractive pricing on all Porsche trailer hitches. Must be purchased and installed by a Porsche Certified Technician. Please see parts for details. Take advantage of all in stock Porsche apparel. While supplies last.